If you next project calls for sharp results, take a look at carbide countersinks for drilling. Amana Timberline drill bits have a 1/4" Hex Shank design for quick release to drill pilot holes and tapered countersinks for wood screws. 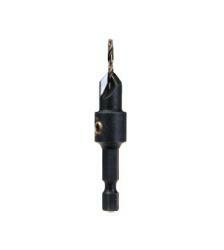 Whether used in hardwood, plywood, plastics or other materials, they are carbide tipped for long lasting results. Click on the image to get complete specifications.